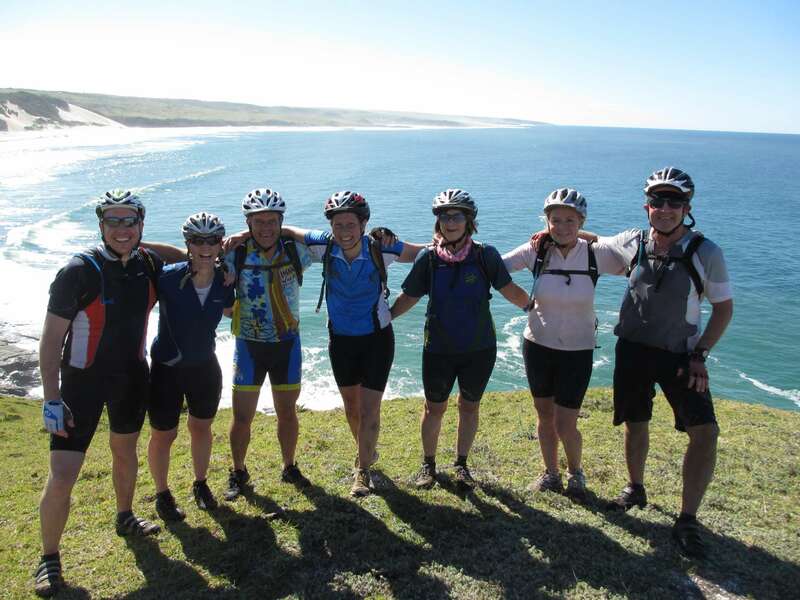 Discover a treasure of mountain biking pleasure on a section of one of the most pristine and magnificent coastlines anywhere in the World, on a guided mountain bike-adventure tour between Kei Mouth and Umngazi River Bungalows. 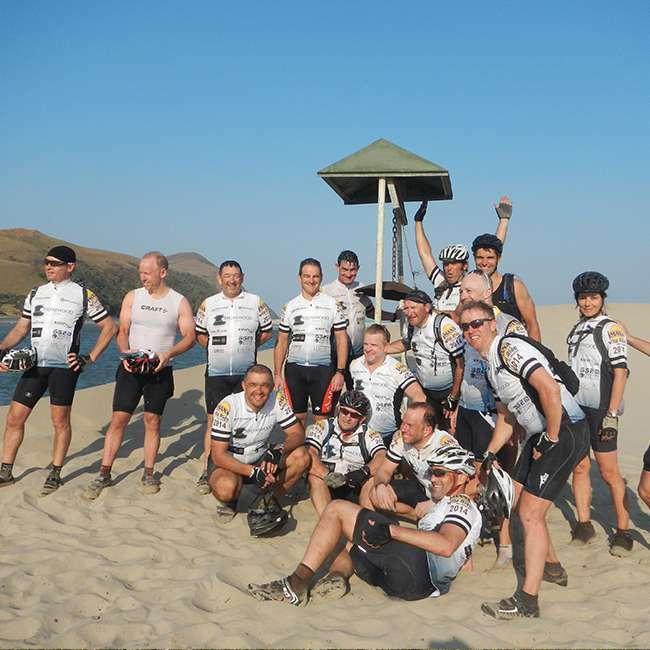 DURATION: 4 days riding (excl. travel time). COST: R11, 750 per rider. [Rates 2016]. 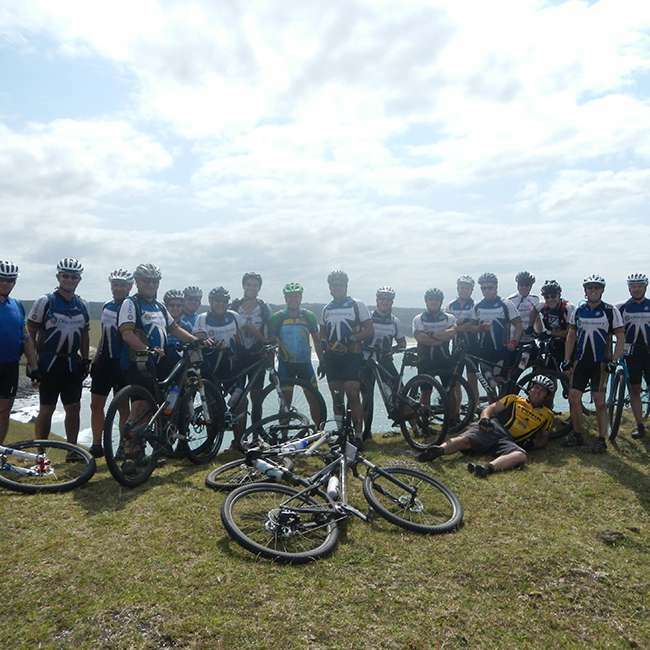 The tour involves four days of mountain biking plus your travel days either side = 6 days leave. Due to the logistics involved, tours need to be planned eight to twelve months in advance. Tours are generally run during the winter months between mid-April and early October. Other key factors to consider when bookings dates are the moon phases; either full moon/new moon (to coincide with Spring tides), as well as school holidays and long weekends (hotels are full). 1. Subject to hotel availability. 2. A minimum group size of 16 pax to a maximum of 30 pax. 3. Spring tides! Ideally dates need to be selected around a new/full moon. 4. Availability of guides ! A quality Ride Wild Tour finishers’ garment. 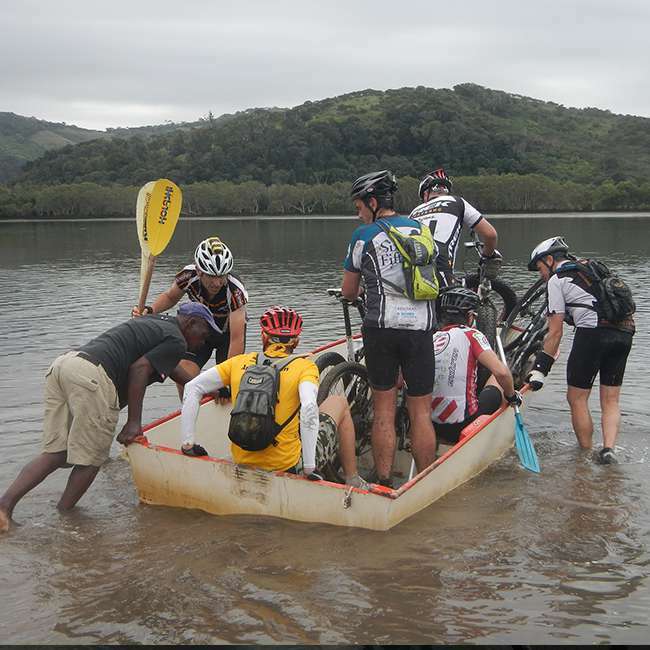 From the start outside Morgan Bay Hotel, ease the legs into tour pace with a with a warm-up cruise through Kei Mouth village to cross the Great Kei River on the ferry. A little tester up ‘Sunrise Surprise’ followed by a fast grassy track descent and onto the beach. 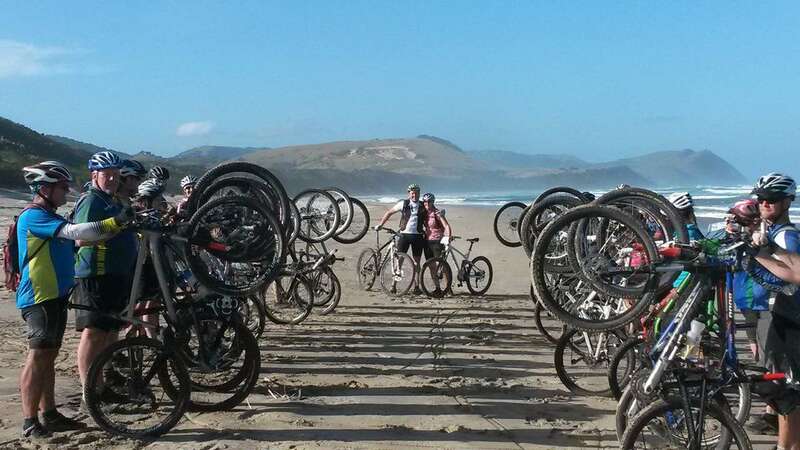 Climbing on day one is insignificant but adapting to beach riding can be more challenging than one thinks. On and off the beach most of the way. Spot the wreck of the Jacaranda. A welcome stop for refreshments at Wavecrest Hotel (about half-way on day one). Some stunning beach riding. A potential swim at Qora River just before Kob Inn (if the pace has been too easy !). 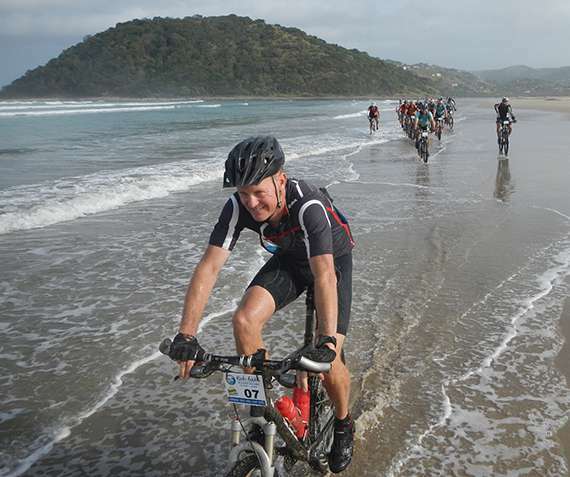 Day two is regarded as the easiest day with mostly good beach riding, some soft sand sections and a few little hills. After crossing the Nqabara River, head into the Dwesa-Cwebe Nature Reserve and experience the first proper ‘Mother’ (a hill too steep for most people to ride). Be rewarded with breathtaking views off steep cliffs into the ocean. Some bundu-bashing through ‘Rhino Valley’ (sadly no more rhino) and onto the last beach section before Mbashe River. Timing is critical, this river can be a big swim if the tide is pushing in. The Haven awaits 2km further on. The terrain changes on day three; the hills kick in ! Still some lovely beach sections but prepare the legs for ‘Mother’s Day’ ! 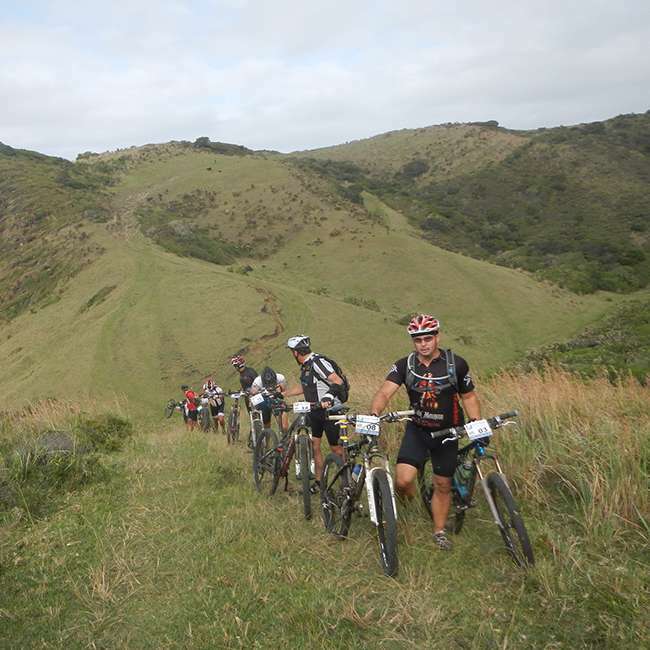 The rewards are great; stunning scenery, single tracks, fast descents. The highlight of the day has to be ‘Hole-in-the-Wall’, a compulsory stop. Leave a little in the tank for the final 11km on district roads to Coffee Bay, aptly named ‘Col-du-Coffee Bay’. Ocean View Hotel provides a welcome overnight stay. A combination of the last three days; beaches, hills, portages, river crossings. 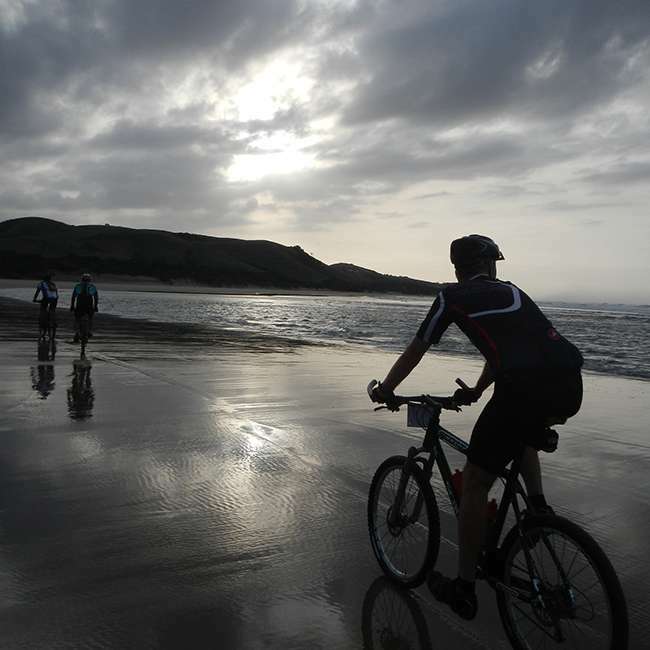 Three big rivers (Umtata, Mtagakie and Mngazana – all have ferries) dictate the pace of the day; the goal is to ride the last beach home over ‘black rocks’ to the finish at Umngazi River Bungalows. Hluleka Nature Reserve marks the mid-way point of the day and the only place for a water refill. 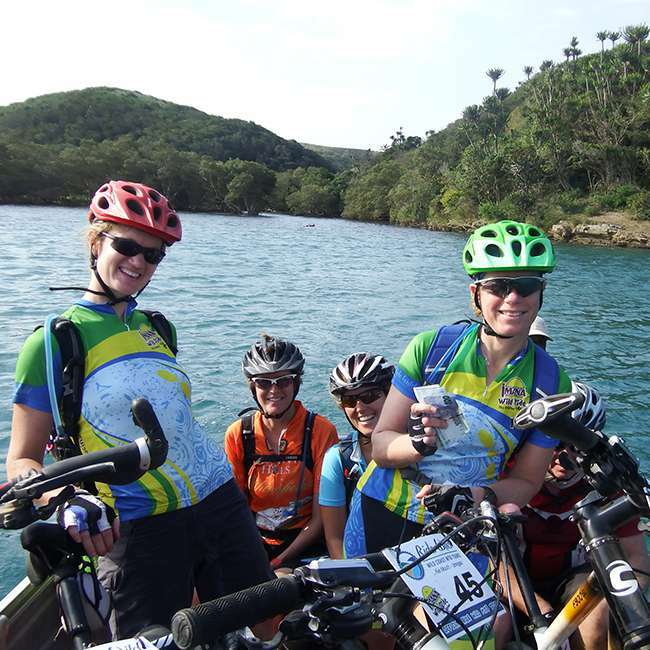 This day also becomes more populated and riders are often welcomed by the cheer of ‘Imana’. The local greeting is ‘Molo’ (singular) / ‘Molweni’ (plural). The reply can be a simple ‘e-ke’. Suitable for: cyclists who are competent on a mountain bike with intermediate to good handling skills. Novice mountain bikers would cope but would just walk the trickier sections. Bike required: good / intermediate level MTB with front shocks. Trail and surface types: terrain is natural, i.e. 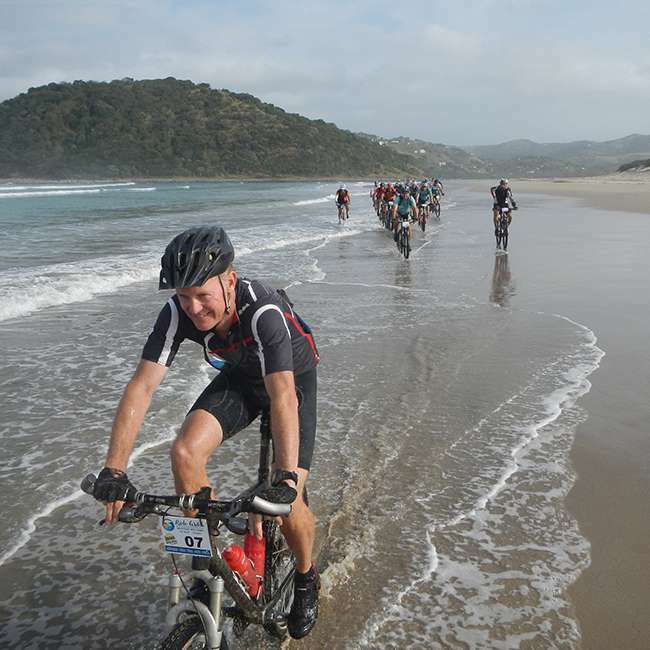 : tracks are paths made by local people and animals, plenty of beach riding moving on / off rock surfaces (which can be slippery), some district roads, grassy hills and steep descents, river crossings which may require some water competency skills. Gradients and technical trail features: most gradients are moderate but might include short steep sections. Includes small technical trail features (such as roots and rock). Suggested fitness level: average fitness will cope but the fitter, the more one will enjoy this ride. Non-riding friends and family are welcome to join the group and follow the backup vehicle to the next overnight between stages. They will need to drive their own vehicle and be prepared to depart at an arranged time at the start of each day (unless they’re willing to find their own way). Vehicles must be able to handle some rough sections of dirt road. 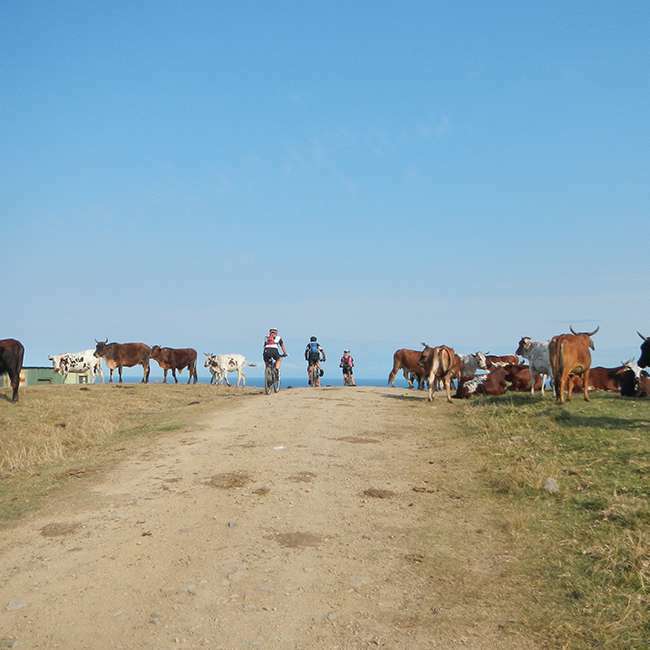 Supporters must be aware that they will not be able to see their riders during the drive from one overnight to the next and the drivers may spend more time in their vehicles than the riders take along the coast. Supporters cost: on request (this includes 5 hotel nights, all meals & a supporter jacket). 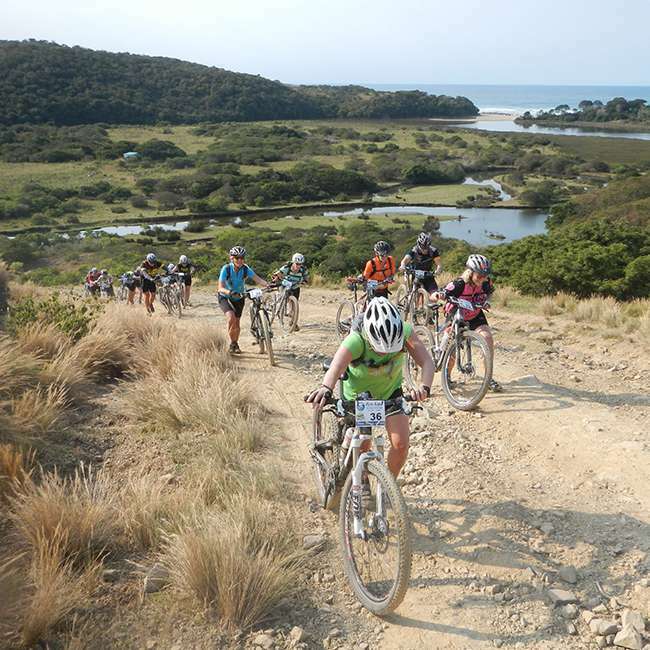 Riders must be prepared for four days of physically demanding mountain biking. 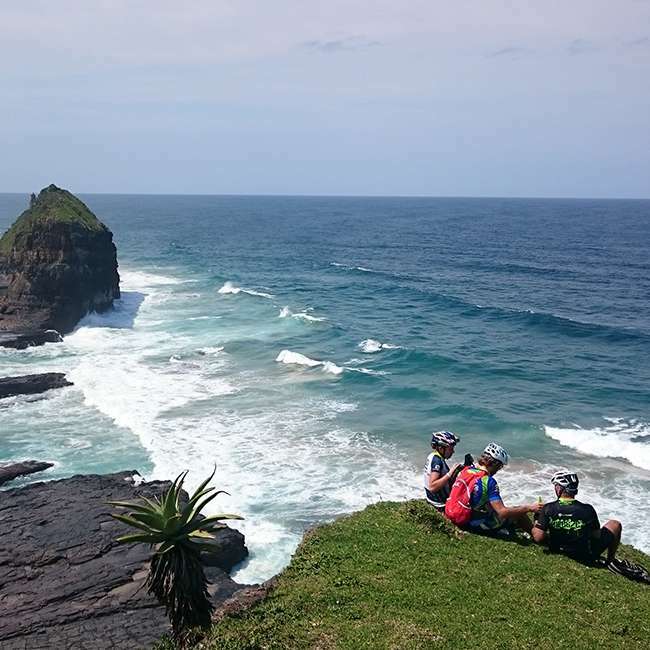 This is the wild coast ! 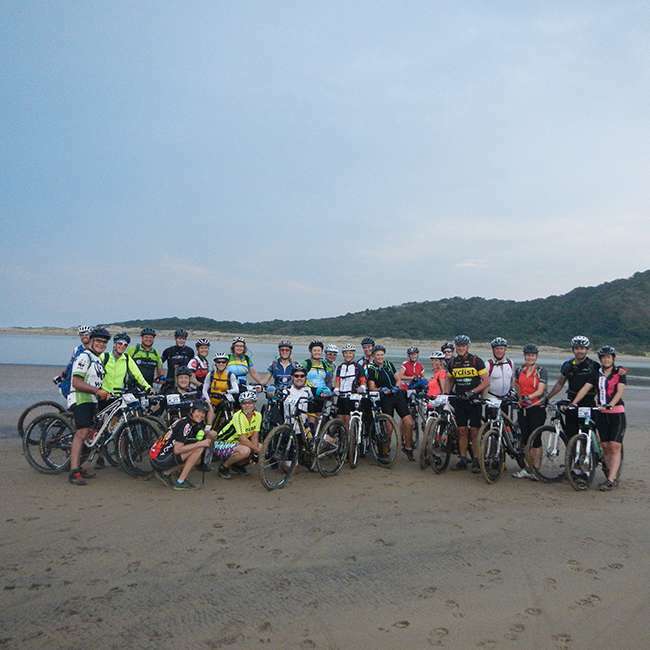 The riding includes beach riding – plenty of magnificent long beaches which at low tide are a joy to ride on – but if you get caught by the tide can become a trudge, as well as soft sand sections behind the rocks and over dunes which can be quite testing. Tracks off the beach and some hike-a-bike strenuous hills; particularly on the third and fourth days. 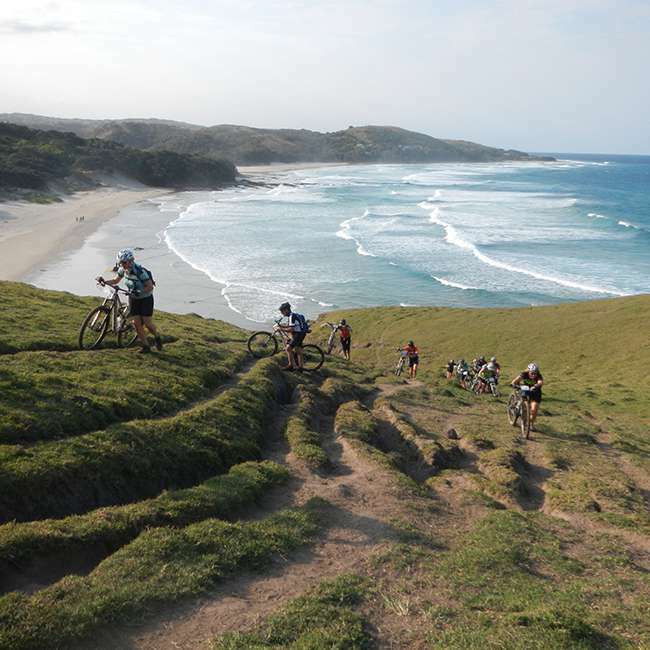 Those accustomed to regular mountain biking and stage racing will comfortably handle this ride. If you have any concerns about your physical abilities please feel free to call us to discuss further – we would rather you are honest now than be disillusioned after day one. For group / corporate tours we can assist with transfers. The best option is to fly into East London and return via East London / Umtata. A minimum of 16 people is required to run the Tour. Should we not meet this requirement the Tour will be cancelled. This will be finalized at least 6 weeks prior to the tour. 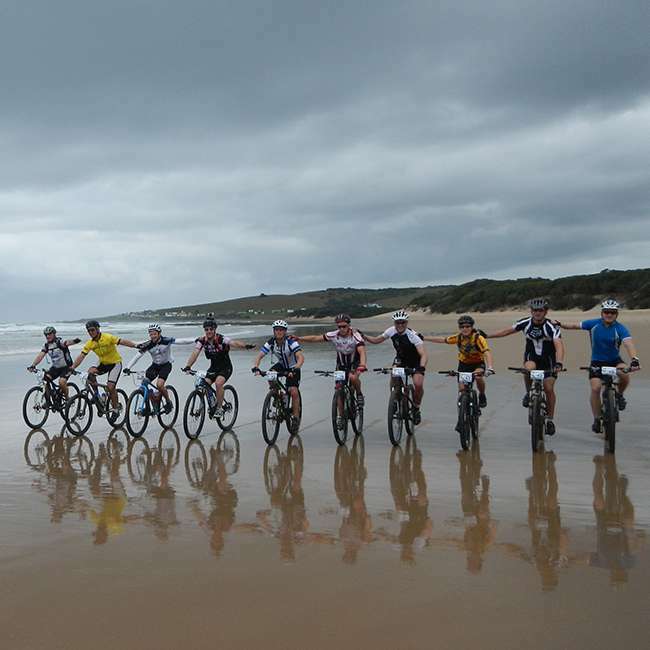 Each person must ensure they are physically fit to handle the four days and 180km of testing riding. Each person will be required to sign an Indemnity at registration before the Tour starts. No refunds will be issued once your booking is confirmed. It is up to you to find a replacement should you be unable to participate for whatever reason. In the case of a replacement please notify the organizers immediately by completing a new Booking Form and e-mailing it to Rebecca. If booking in a group (two or more) please submit all booking forms together and indicate the names of those in your group. It is preferable to book a minimum of two people due to hotel rooms catering for combinations of two or more. Any individuals wishing to book may have to share a room with someone else or alternatively pay a single supplement fee (depending on availability).